Ladies, let’s admit that we have an awkward relationship with beauty. I actually have another phrase that I use…we have an ugly struggle with beauty. This is such a shame because Psalm 45:11 tells us that God is enthralled with our beauty. Unfortunately, we are not so enthralled with our beauty. How often do we criticize, complain or cry about how we look in our clothes? Furthermore, how many of us feel guilty, even less spiritual because we do care about how we look? We’re in for a treat today because my friend, Shari Braendel comes to our rescue! Shari is considered the leading voice for America’s Christian women when it comes to the topics of fashion, beauty, and dignity. She connects with thousands of women each year to inform, encourage and inspire them. Easily identifying your body type and great tips on dressing for your body. How to tell if your bra is fitting correctly. Oh, my goodness, we had so much fun with this! She’ll teach us a helpful strategy to increase our confidence once we get dressed for the day. SPECIAL OFFER! Buy Shari’s 27 Hangers program for only $27! If you purchase the program by January 7, 10% of your purchase will be donated to Living In Truth, a ministry that focuses on body image, self-esteem and eating disorders. You can go to Shari's website for more information. You can subscribe to Shari’s weekly newsletter, learn more about her book, discover her products and much more! TELL YOUR FRIENDS! Did you enjoy this episode of Better Together? If so, tell your friends by sharing this episode with them. 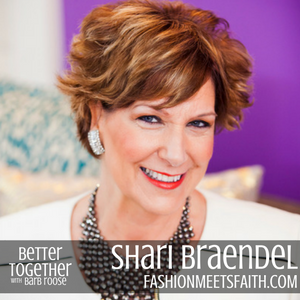 ABOUT SHARI BRAENDEL: Shari is considered America’s leading Christian Style Authority, CEO of Fashion Meets Faith and developer of the 27 Hanger Closet Online Academy. Inspiring thousands of women each year to new levels of confidence at conferences around the globe, she leads with an encouraging heart and vibrant spirit helping women see themselves the way God might. Author of Help Me Jesus, I Have Nothing to Wear and the fashion editor of More To Life Christian Magazine, Shari desires to inspire females of all ages to dress with dignity and style. She has been featured on Focus on the Family, The Total Christian Television Network, K-Love, Moody Radio and more. Shari lives in Charlotte, NC with her husband Dave, three lazy cats and a very overweight yellow lab. Her only son Luke attends the United States Military Academy at West Point and is an Army Basketball player so she loves watching him play ball! She also has adult triplet stepdaughters and one precious grandchild. 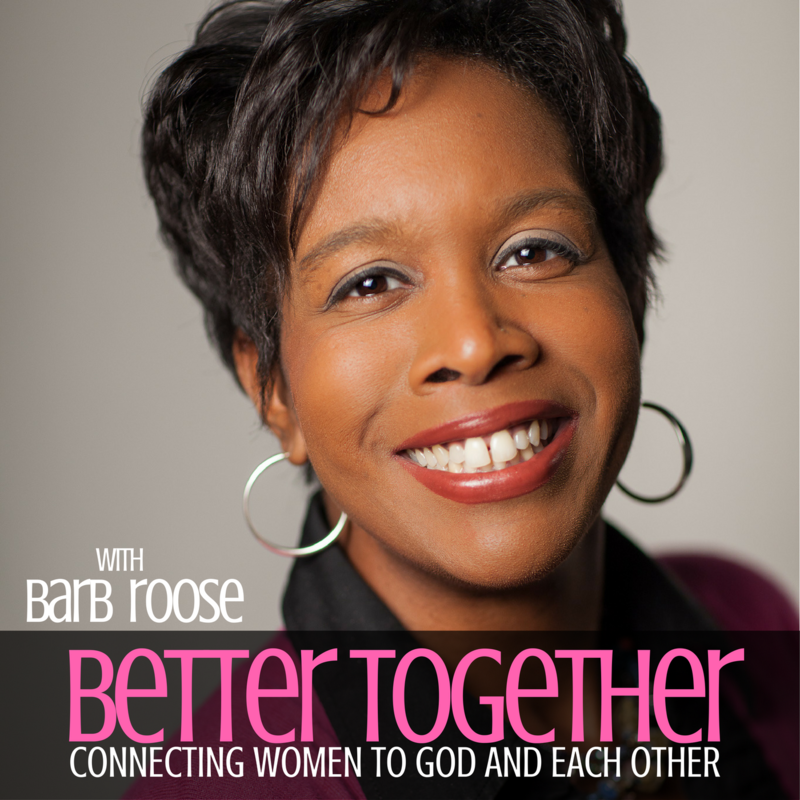 The Better Together Podcast with Barb Roose is coming in January 2016! Friends, life can be crazy sometimes, right? Where do you go when you are pressed for time and you're all out of answers? It's a perfect time to call your girlfriends! Speaker and author Barb Roose gathers real women sharing their real life experience about the topics that we all care about - family, friends, career, health and faith. The Better Together podcast will air new episodes twice a month. If you don't want to miss an episode, make sure to subscribe to barbroose.com or subscribe to "Better Together with Barb Roose" on iTunes or Google Play. Do you have ideas for podcast topics or suggestions for great podcast guests? Tell Barb! Email barb@barbroose.com. She'll probably send you a little "something-something" for taking the time to reach out and connect. Make sure to listen to the podcast preview and share it with your friends!